There’s only one day left in November! When did that happen? Well, since there’s kind of an unwritten rule that pumpkin is only eaten during October and November, that means you better try all those awesome recipes while you still can. 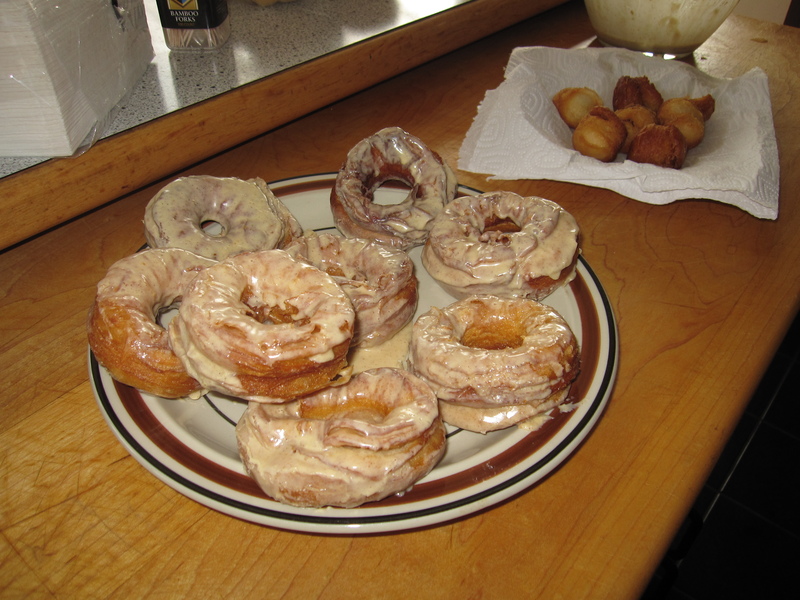 My mom made pumpkin donuts the day after Thanksgiving (yeah, like I really needed to eat donuts after that feast…), and THEY WERE AWESOME! The dough was just flaky biscuits, but the outsides got nice and crispy, and the insides were soft but not heavy. Mmm and the glaze… Don’t get me started! 1) In 2-quart saucepan, heat oil over medium heat to 350°F to 375°F. 2) In large bowl, beat powdered sugar, pumpkin pie spice, pumpkin and just enough half-and-half with whisk until smooth and thick glaze forms. Set aside. 3) Separate dough into 8 biscuits. Using small round lid or cookie cutter, cut hole in center of each biscuit. 4) Gently place 2 or 3 biscuits in hot oil. (Biscuit holes can also be fried!) Fry on one side until golden brown. With tongs, gently turn each biscuit over; fry until other side is golden brown. 5) Remove doughnuts from oil; immediately dip into pumpkin glaze. Place doughnuts on cooling rack; cool 3 to 5 minutes or until glaze is set before serving. First of all, I freaking LOVE starting the weekend on a Wednesday. I’ve really grown to appreciate the few days I have off, and Thanksgiving was exactly what I needed. Anyway, we started the night at one of my favorite places, The Pony, and then wandered over to Deuces, where the picture-taking extravaganza began. I’ll just share one pic with you; others will be on Facebook in time. 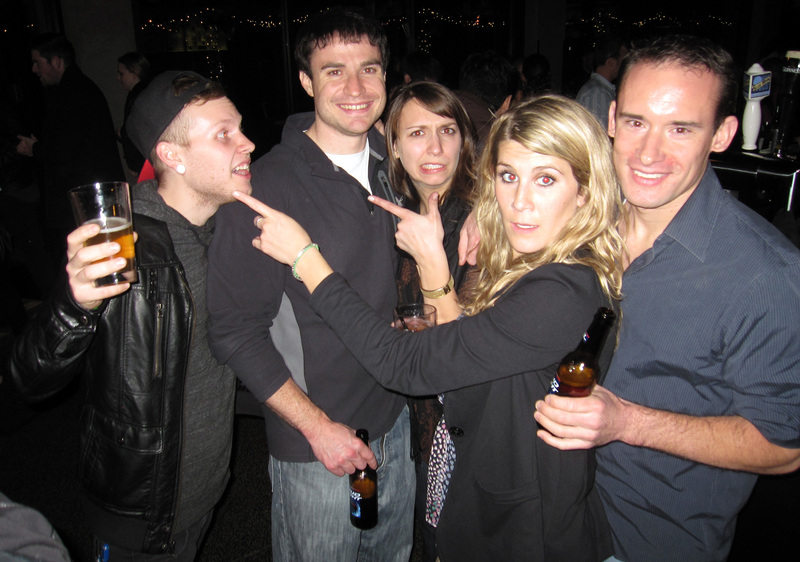 But here, we’re trying to take a cute group photo with the old kickball gang, and this rando shows up and ruins it. Of course THE BOYS DIDN’T NOTICE. What with tomorrow being THANKSgiving and all, I feel like talking about some materialistic thing that I want probably isn’t the most tactful thing to do. So for this Wednesday, what I want is for you all to have a great Thanksgiving and a fruitful Black Friday (if that’s your thing). Can you believe it? CHRISTMAS IS ALMOST HERE, Y’ALL! The photos remind me of those old iPod commercials. 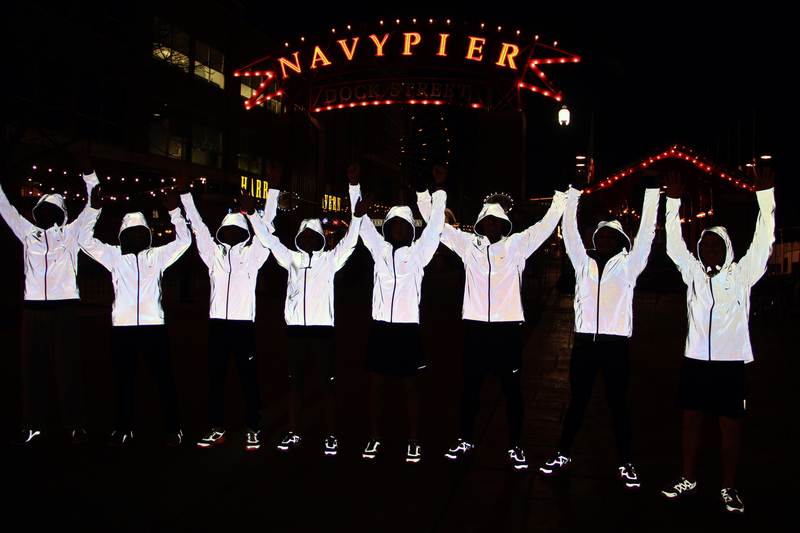 I wish I had gotten a little more heads up – I had no idea what it was for; they just told me to show up at 5:30 – because you could produce some really awesome photos with these jackets. I’d just buy one myself to play around with, but they retail for a smooth $350. I’m not THAT serious of a runner or photographer. I went to Randolph Street’s Holiday Market on Saturday. These are monthly markets (obviously not all are “holiday” themed) in the old Plumbers Hall, across from my gym and not far from my place of employment. I’d been meaning to make it out to one all summer, and I thought this one might help me get a jump on my Christmas shopping. I didn’t get a picture of the cute Argentinian guys selling empandadas. Might be worth the $10 ticket, ladies. But I’m not sure I’ll be returning anytime soon. Maybe I should give one of the regular, non-holiday ones a try. Or perhaps I’ll wait for the Renegade Craft Fair instead. It’s free, and it seems more DIY-FRIENDLY. Isn’t this Kate Spade weekender fabulous? I love the warm leather with the striped lining. I always pictured my adult self as someone with fabulous luggage, walking up the stairs to a private jet, sunglasses-clad, waving like Jackie O (and never dressed in sweatpants. Oh, how travel has changed). Instead I have a very beat-up, basic three-piece set – one with a busted zipper, one with a busted handle and one that’s actually missing… IT’S TIME FOR AN UPGRADE.